Create a project using burlap and/or lace! You have TWO WEEKS to play along - Deadline to enter is Friday, September 9th, 2016 at Midnight CST. The winners will be announced on the NND blog. Post your project to your blog or to an online photo gallery such as Flickr, Pinterest, or splitcoaststampers (on splitcoast please use keywords newtonsnook and IPC35). Several of our Design Team Members decided to play along - check out all the awesome burlap and lace cards they created! Read the description below each card to see who made it. 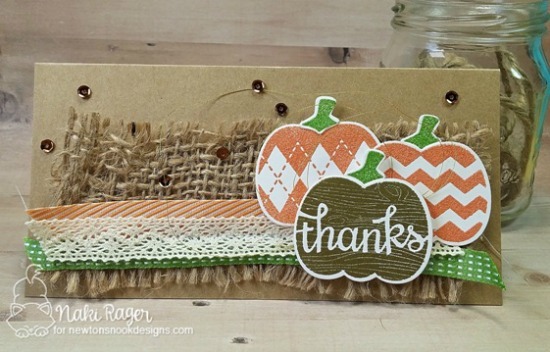 Naki created an awesome pumpkin card using burlap and lace with our Pick-a-Pumpkin stamp set and Pick-a-Pumpkin Die Set! Such a perfect look for Fall! 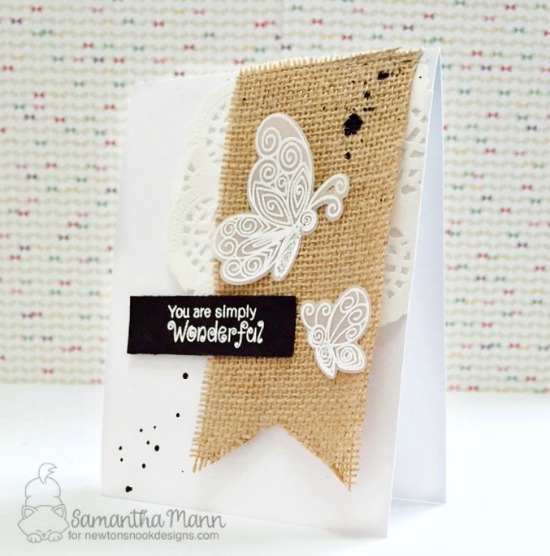 This simplicity on this card by Samantha is so lovely! She used burlap and a lace doily along with the butterflies from the Beautiful Wings stamp set and coordinating Beautiful Wings die set. 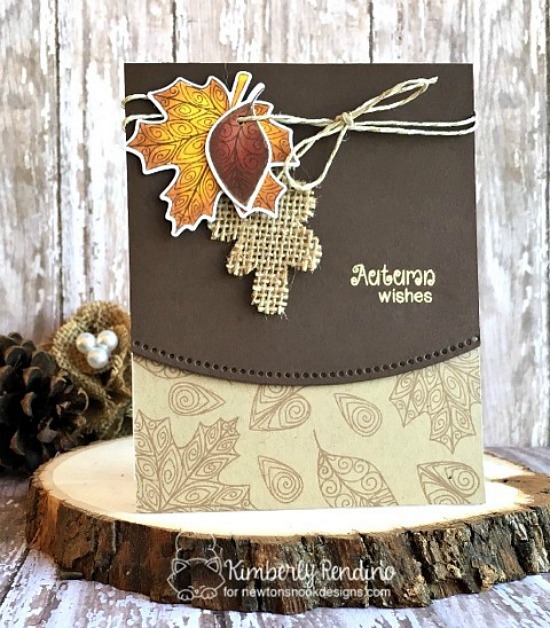 Kimberly created this awesome Autumn card using our new Beautiful Leaves stamp set and coordinating Beautiful Leaves die set! 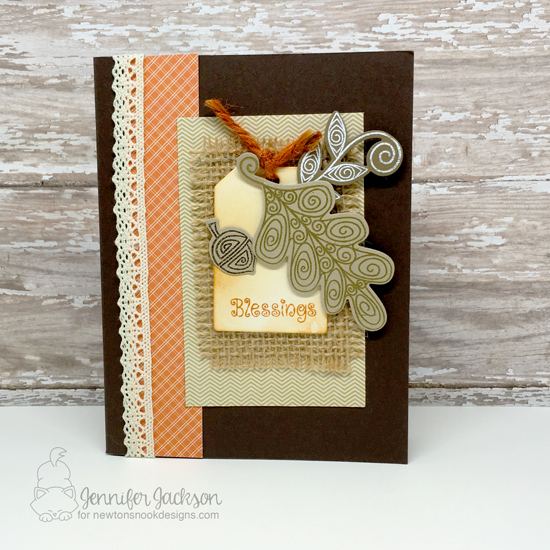 I love the burlap leaf that she cut out with the oak leaf die! Crafty Math-Chick used burlap as a fun background for the die cut deer shape from our Splendid Stags Die Set. Then she added the "Happy Birthday" from the new Raccoon Rascals stamp set. What a great masculine birthday card! Of course I had to play along too! I used the images from the Beautiful Leaves stamp set and embossed them on kraft colored paper in gold, white and brown. Then I trimmed them out with coordinating Beautiful Leaves die set. The tag was cut out using our Tags Times Two Die Set. I added some burlap behind the tag and a strip of lace too!